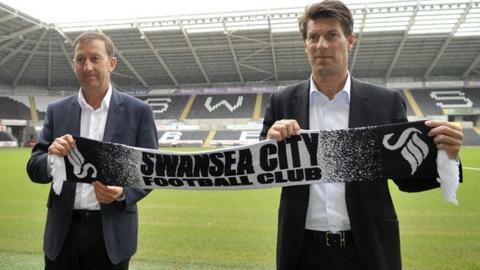 Chairman Huw Jenkins has revealed there is "no pressure" on Swansea manager Michael Laudrup to sign a new contract. The Swans have offered the 48-year-old Dane a one year extension on his current contract which will take him up until 2015. Laudrup has guided Swansea City to a place in the Europa League next season by beating Bradford 5-0 in the Capital One Cup final on Sunday. "Michael knows there is no pressure either way," said Jenkins. "We have that relationship and whatever he wants to do we are happy with and go along with. "We can take his contract and looking for players into account and move things forward from there. "We have been talking and we will talk over the next few weeks or month in connection with looking to extend that." Laudrup currently has a contract until the summer of 2014 and has always reiterated his intention to stay in south Wales for a second season. But the former Denmark international midfielder recently won 72% of the votes in a poll among the Real Madrid supporters, on who should succeed Jose Mourinho at the Bernabeu. Laudrup, who won a league title with Real Madrid in 1995, was ahead of Chelsea manager Rafael Benitez and Paris St-Germain's Carlo Ancelotti in the poll. Watch Sport Wales, BBC Two Wales, Thursday 28 February (19:00 GMT) for an exclusive interview with Swansea City chairman Huw Jenkins.